Breakfast cereal isn't just for kids and can be a tasty and healthy part of any grown-up's morning meal. Look for brands that are lower in sugar, sodium, and fat, but higher in fiber and protein. Calorie counts are important too. It's also a good idea to look at the ingredients list. Whole grains or oats should be at the top of the ingredients lists. Shredded wheat is the simplest of all the cereals. It's nothing but wheat and a little bit of BHT as a preservative. It has no sodium and no sugar and one cup of Shredded Wheat has 6 grams fiber and 6 grams protein, which makes it the top choice here. Calorie-wise it was about in the middle of the pack, with 170 calories. Serve Shredded Wheat with some fresh berries and either milk or almond milk. Since it doesn't have any added sugar, you could add a teaspoon of sugar and still be under 5 grams per serving. 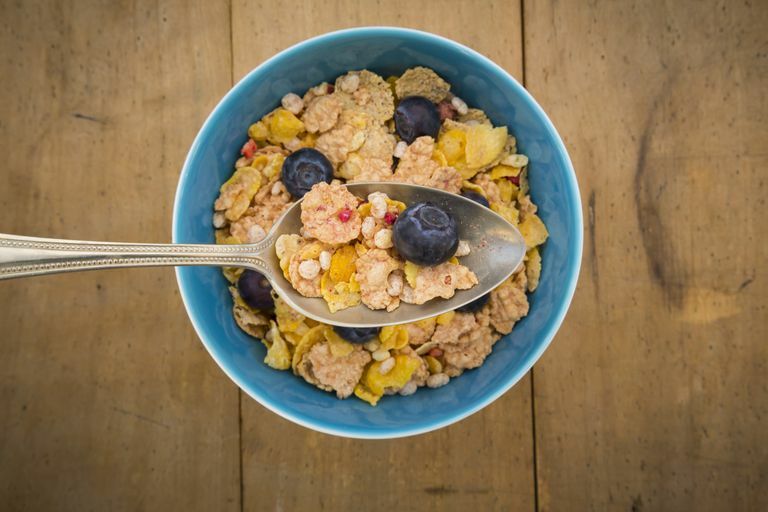 Breakfast time is good for getting more fiber, and one cup of Fiber One cereal has 28 grams of fiber. The original Fiber One has no sugar and 4 grams of protein. It's on the lower end of calories, too, with 120 per one cup. Its first two ingredients are whole grain wheat and corn bran. It's not the lowest in sodium, with 220 milligrams per cup. But it's not high in sodium either. Most people need more fiber but be careful if you want to switch to this brand from a lower-fiber cereal. You ought to start with half a cup (that's the serving size on the box) and work your way up. That's because your digestive tract may need a little time to get used to the extra fiber. One cup of Cheerios (the original) as only one gram of sugar, 3 grams of fiber, 3 grams of protein and only 100 calories. The first ingredient is whole grain oats and cornstarch. It also has 140 milligrams sodium per one-cup serving, so it's excellent for a low-sodium diet. Serve Cheerios with your favorite type of milk and some sliced fruit or berries. It's another cereal that leaves room for a spoonful of sugar if you like a sweeter flavor. Total's big thing is that it's loaded with vitamins and minerals. Of course, all these cereals are fortified with some amount of micronutrients, but Total contains 100 percent of most of them. That's good, but it's important to continue to eat plenty of healthy fruits and vegetables the rest of the day. Total is good because it has 4 grams fiber, about 3 grams protein, and 133 calories. That's pretty good sodium-wise, with 186 milligrams. It has a bit more sugar than other brands, and is listed as the second ingredient, after whole grain wheat, and has about 7 grams of sugar per cup of dry cereal. But it's fine as long as you don't add more sugar. Add berries and fruit for extra sweetness instead. This one might be a surprise because it's one of the sweeter cereals, but hey, not everyone wants something that tastes like cardboard every morning. But even though it's sweet, the first two ingredients are corn and whole grain wheat (you'd be surprised how many cereals have sugar listed second). It does have a little more sugar than the others, with 8 grams per one cup of dry cereal, so it's not a good idea to add any more sugar to a bowl. But it has almost 3 grams of fiber and 3 grams of protein. One cup has about 160 calories and 187 milligrams sodium, which isn't bad. Wheaties aren't really a sweet cereal, but they do have a little sugar added. Still, with 133 calories, 253 milligrams sodium, 5 grams sugar, 4 grams fiber, and 3 grams protein, it's a solid choice for a healthy breakfast. The first two ingredients are whole grain wheat and sugar. Wheaties is good when it's topped with fruit or berries, along with your favorite type of milk. Maybe some whole grain toast and nut butter on the side. Corn Chex is another rather plain cereal, but it's low in calories and sugar, so it makes the top seven. One cup has 120 calories, 220 milligrams sodium, 3 grams sugar, 2 grams fiber, and 2 grams protein. The first two ingredients are whole grain corn and cornmeal. Since it's low in sugar, you could add a little bit of regular sugar. But since it's on the low side as far as fiber content, I think it should be served with a big helping of fresh fruit. These brands aren't really bad for you but they didn't make the list of the healthiest adult breakfast cereals. Note: Too much sugar and a lot of sodium for a breakfast cereal. Fiber and protein are good, though. Note: Another cereal with too much sugar. Too bad, because it's got enough protein and fiber to make me happy. Note: It's high in sugar, but much of that is probably coming from the raisins, which isn't all bad. It has plenty of fiber and a good amount of protein. Note: Plenty of protein and low in calories, but the lack of fiber is disappointing. Note: Not too bad. Low in calories and sugar, and has some protein, but is also low in fiber. Note: On the positive side it's not high in sodium and has plenty of fiber and protein. One downside is that it has too much sugar and this is the one cereal that has a lot of fat, with about 9 grams. Note: Lots of calories for a breakfast cereal and too much sodium. But it's high in fiber and protein. Note: Here's another case where the extra sugar might be coming from the raisins. It has plenty of fiber and protein. Note: This one isn't the worst cereal, but it's fairly disappointing. Note: These are basically colorful rice crispies. Note: Maybe a childhood favorite but not a great choice. Eating cereal for breakfast is a great idea because it's easy to prepare. You can eat a quick meal and get out the door to start your busy day. Choose cereals made with whole grains without excess sugar and dress them up with fresh fruits and berries for extra health benefits. Are English Muffins Healthier Than Regular Bread? Should You Start Using Wheat Germ Oil? What Nutrients Do Tomatoes Provide?